That's it! It's done! I have a few more seams to hide, but I'm not stressing over it, I can do those later. I knit socks so often, I totally forgot about the many hours I have take to seam these sweaters. Granted, I am very proud of the seam job I did on this sweater. I took my time, and I think it turned out just fabulously. I can definitely see myself wearing this sweater. But I am glad it's done! I know, that's a lot of yarn. That table is my working bench..yarn, books, my swift and ball winder. So, I have all this yarn and patterns already. So where did this come from? I love the new Interweaves. I want to knit the cover design. The new Vogue Knitting is amazing. For the first time, I like more of the Vogue designs than the IK. Design #27, the Cabled Tunic. I loved this cable sweater with the split collar. 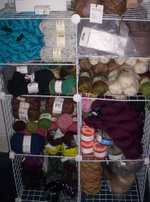 I chose Cascade 220, despite the gauge calling for 4 sts/". 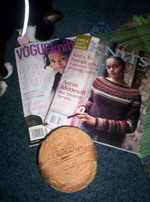 With some help from Katie at Borealis, I hope to knit the largest size with a gauge of 4.5 sts/". We think that'll work. But I only started a sleeve, just in case it doesn't. Oh, Meg wanted to properly say hi, but her daddy says it's bedtime...'night! I'm tired. I keep seeing pink and green. It's time for bed. No more computer tie compromises. It's all mine. Granted, it hasn't been the easiest time converting all my stuff from PC to Mac, especially the iPod, but it's so nice. And it gets easier to use each time I'm on it. I've been playing around with it this weekend, so it's not my reason for not posting. I hope to ditch Typepad soon and build my own blog, but I need to look into that more. I got the black one for the sheer purpose that it matches my iPod. Sickening, I know. I haven't posted this week, because--GASP! on Tuesday, I ran out of yarn. I am so close to finishing the sleeves. I knit them both at the same time, and I'm right at the part to start the sleeve cap...I ordered 2 more skeins from Knit Happens online, so it should be here any day. It's my fault. I skimped on the yarn and bought 12 instead of 14, because Debbie Bliss tells you to buy so much more than you need. And I think I only needed one more, but I could use the extra yarn for something. I've been floating around, because this sweater was my only knitting project for the past three weeks. So, I looked in the WIP basket for something to knit, and I came across these two bags that needed finishing. I started both these bags when I had an apartment w/a personal washer and dryer so I could felt them, but alas, this new apartment has a timed coin washer that I don't think I can control. I need to look into that..I'd like to add 2 more FO's to my collection. The big strawberry and pink bag is the Vertical Felted Bag kit from Pick Up Sticks, and if you're in the Twin Cities, you may recognize the little pastel pink bag from the Knit for the Cure promotion (for lack of a better word) from last year. Well, that was fun. I'm not a felted bag person, and these were my trial runs to see if I liked felting, but to knit so much and for so long just to shrink it later in the wash? A I the only one that thinks that's crazy? LOL...all that work! There's plenty more projects in the WIP basket, but I need to start the baby blanket I promised so I can get back to the Fair Isle Cardigan before the Fair Isle Knitters webring I joined a few weeks ago kicks me out (I saw someone bring in their cardigan to the LYS today and I was so jealous).The pattern I have for this baby blanket is so simple. But it wasn't my vision. No, my vision makes it much more complicated.. Umm..I think that's it. 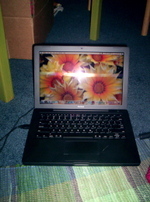 Seth knows nothing about Macs, he's a PC man--he built our his desktop, so I'm flying solo on learning this thing. It's not that hard, but building a website and eventually a podcast will be a bit of challenge, but now I can post any bloody time I want! I have my internet freedom!